Bailey® began producing fine headwear in 1922, priding itself on founder George Bailey’s emphasis on the importance of a professionally crafted hat. Bailey® hats and caps are known for the craftsmanship, innovative design and luxury fibers and fabrics including fur felt, wool felt, leather, LiteFelt®, genuine Panama, wool, linen and cashmere. Classic styles such as fedoras, godfathers and derbies were engineered and popularized by Bailey® hats in the 1920’s. 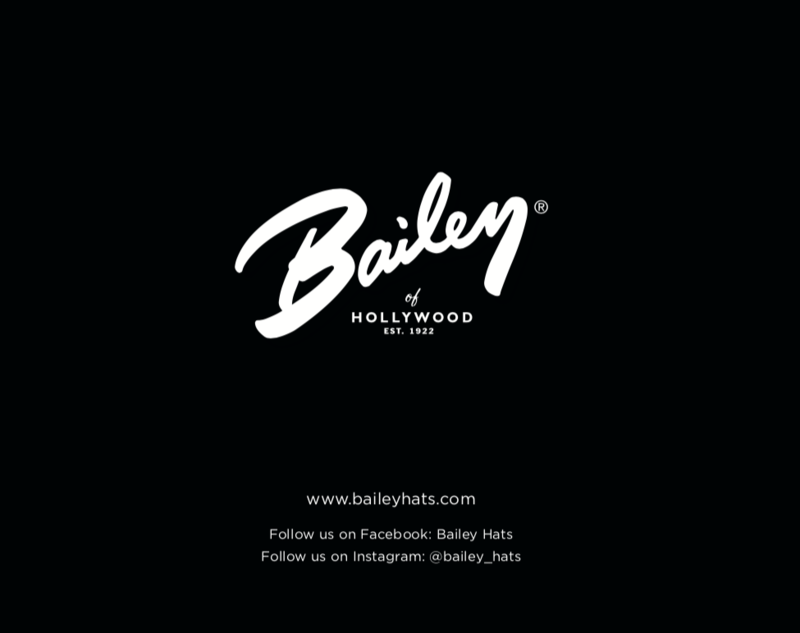 Bailey® hats were seen on silver screen icons like Clark Gable and Humphrey Bogart. These individually handcrafted hats last a lifetime and always carry a strong and sophisticated look. The hats are durable and most provide protection in any weather. Bailey’s® product handwriting and brand credo defines a mixture of Hollywood elegance and Western toughness, influenced by directional fashion that creates unique and consistent positioning and brand integrity. The product includes timeless masculine products that customers buy again and again, as well as seasonal cultural statement pieces that generate a feeling of unique stylishness.